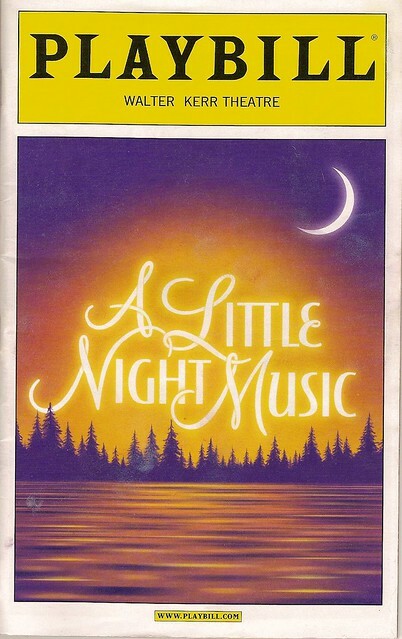 While we were in New York last week, PJ and I saw A Little Night Music, starring Bernadette Peters and Elaine Stritch. We had never seen Peters or Stritch live before; we had also never seen a live performance of a Stephen Sondheim play. We had wanted to see this production last year, when Catherine Zeta-Jones and Angela Lansbury were starring in it. I’m glad we had to wait a year. In case you don’t know, A Little Night Music is about romantic intrigues among a group of Swedish couples around the turn of the twentieth century. Desiree is an aging actress with an illegitimate daughter who lives with Desiree’s mother, an elderly woman who lives with her memories of her own sordid liaisons. Desiree is beginning to feel that it’s time to leave the stage and settle down. She returns to her home town in the hopes that her daughter’s father, who was relatively recently widowed, will pick up where the two of them left off. He wants to–after seeing her on stage, he wants to resume their previous affair, but he is now married to a much younger woman, putting an end to Desiree’s fantasy of settling down together. Or so it initially appears. Desiree soon learns that her former lover, Fredrik, and his young wife, Anna, have yet to consummate their marriage after six months, giving her hope that she will be able to seduce him away from Anna. To accomplish this seduction, she invite him and his family, which also includes an older son, Henrik, who is in seminary, to her mother’s country estate for the weekend. When Desiree’s current lover, a married dragoon named Count Carl-Magnus Malcolm, becomes jealous of her interest in Fredrik, he and his much abused wife, Charlotte, decide to tag along on the trip to the country. The second act is a comedy of errors in which all of the romantic tangles are resolved. “Send in the Clowns” occurs near the end of Act 2. Desiree has just admitted that she loves Fredrik and wants him to marry her. He responds by revealing that he actually loves his wife and wants to end his affair with Desiree. Thus, the song is her tragic ode to the irony of her situation: when he wanted her, she left him for the stage; now that she wants him, he’s unavailable. Peters imbues the song with all of the emotion it deserves. It’s the high point of the play, and she knocks it out of the ball park. I’d like to contrast Peters’ performance with those of her predecessors. Now I’ll admit that it’s difficult to judge a performance by a video of a performer singing in an entirely different context, like the Tony Awards broadcast, for example. But still, seeing these other clips should at least give us a glimpse at how other actresses played the part. Johns captures a kind of fierceness, especially in the first part of the song, that is also wonderful. All this is to say that Bernadette Peters ranks among the best of the actresses playing this part. She was wonderful. Overall, this production was great. The sets were excellent without overwhelming the action. And all of the actors were good. The play is funny, tragic, and delightful. PJ and I definitely want to see more Sondheim as soon as we get the chance.